a. ^ No law was passed making God Save the Queen the official anthem. In the British tradition, such laws are not necessary; proclamation and usage are sufficient to make it the official national anthem. God Save the Queen also serves as the Royal anthem for several other countries. b. ^ Under the Council of Europe's European Charter for Regional or Minority Languages, the Welsh, Scottish Gaelic, Cornish, Irish, Scots, and its regional variant, Ulster Scots, are officially recognised as regional or minority languages by the UK Government for the purposes of the Charter. For the dominion of David and Solomon, see United Kingdom of Israel. 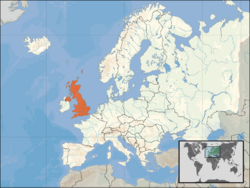 The United Kingdom of Great Britain and Northern Ireland (commonly known as the United Kingdom (UK) or Britain) is a country in northwest Europe that is made up of four constituent parts. Three of these—the countries of England, Wales, and Scotland—are located on the island of Great Britain. The fourth part is Northern Ireland, which is located on the island of Ireland and is a province of the United Kingdom. The border between Northern Ireland and the Republic of Ireland forms the United Kingdom's principal international land border. Apart from this land border the UK is surrounded by the Atlantic Ocean, the North Sea, the English Channel and the Irish Sea. The UK was formed by a series of Acts of Union which united the Kingdom of England (which included Wales as a principality) with those of, first, the Kingdom of Scotland, and then the Kingdom of Ireland under a single government in London. The greater part of Ireland left the United Kingdom (then called the United Kingdom of Great Britain and Ireland) in 1922 to form an independent state. This state later became the Republic of Ireland. Six counties in the north-eastern portion of the island, meanwhile, remained a part of the United Kingdom, forming Northern Ireland. Scotland, Wales, and Northern Ireland are devolved administrations, each with varying powers, based in their capital cities Edinburgh, Cardiff, and Belfast respectively. Certain islands around Britain are not fully part of the United Kingdom. The Isle of Man has its own parliament, the Tynwald, but is part of Britain for the purposes of Value Added Tax and is also therefore part of the European Union. The Channel Islands, off the coast of Normandy, France are not part of the European Union, and are ruled by the Queen of the United Kingdom in her capacity as Duke of Normandy, they being the last remnant of that duchy not in French hands. All these islands have their foreign affairs managed by the British government. Great Britain, or just Britain, is the geographical name of the largest of the British Isles (often also including its smaller neighbouring islands, though never Ireland). The term "Great" is used in opposition to "Little" Britain or Brittany in France (the -ny ending being diminutive). Politically, the term Great Britain refers collectively to the nations of England, Wales and Scotland (i.e., the United Kingdom except for Northern Ireland). This political usage of "Great Britain" dates from the personal union of the Crowns of Scotland and England in 1603, with the term being used in the sense "all of Britain." The British Isles is sometimes used to describe an archipelago of islands including Great Britain, Ireland, the Isle of Man, Isle of Wight, Orkney, the Hebrides, Shetland Islands, Channel Islands, and others. However the term is not used in Ireland because it was sometimes understood internationally to mean "the islands belonging to Britain," a description out of date in the case of Ireland since 1922. An alternative term, Islands of the North Atlantic (IONA), is sometimes used. Britain was established as part of the Roman Empire long ago and eventually suffered from Viking attacks until it was able to control itself approximately 1,000 years ago. Throughout the past millennium Great Britain has fought many wars, including a 100 year war with France, and grew into the biggest and most powerful empire in the world. Great Britain has had many monarchs and eventually developed a democratic parliament to govern it. It gave rise to the United States of America, the most prolific Creationism country in the world, in the 18th century and fought against Germany in both World Wars. Possibly Great Britain's most noteworthy historical episode is the creation and signing of the Magna Carta. This page was last modified on 12 March 2014, at 14:00.